Posts tagged with "treat yourself"
In the spirit of Valentine’s Day, dermatologists from the American Academy of Dermatology are advising the public about a simple yet important self-care routine: nail grooming. 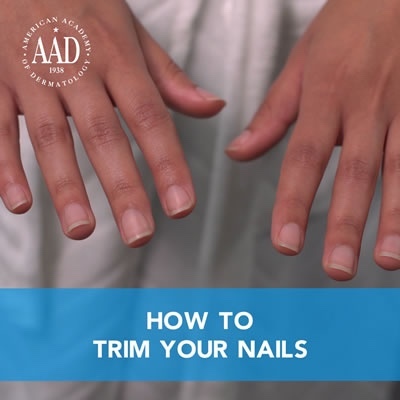 Not only do short, well-manicured nails look great, they say, they are also less likely to harbor dirt and bacteria, which can lead to an infection. In addition, the right nail clipping technique can help prevent common issues like hangnails and ingrown toenails. Headquartered in Rosemont, Ill., the American Academy of Dermatology, founded in 1938, is the largest, most influential, and most representative of all dermatologic associations. With a membership of more than 20,000 physicians worldwide, the AAD is committed to: advancing the diagnosis and medical, surgical and cosmetic treatment of the skin, hair and nails; advocating high standards in clinical practice, education, and research in dermatology; and supporting and enhancing patient care for a lifetime of healthier skin, hair and nails. For more information, contact the AAD at (888) 462-DERM (3376) or aad.org. This entry was posted in Health and tagged 360, 360 Magazine, aad, American Academy of Dermatology, beauty, care, dermatologists, Dr. Lipner, health, how to trim your nails, nail, nails, self care, self love, Shari Lipner, Tara McDonough, toenails, treat yourself, treatment, Valentines Day, Vaughn Lowery on February 12, 2019 by wp360mag.